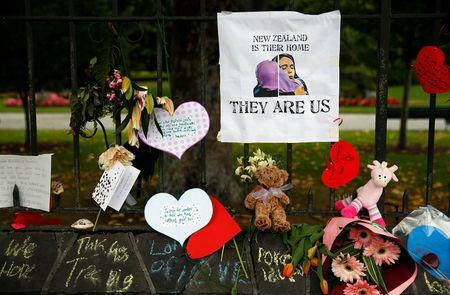 CHRISTCHURCH (Reuters) - New Zealand police promised a high-profile presence as schools and businesses in Christchurch reopened on Monday after a gunman killed 50 people at two mosques in the city last week, and the prime minister said she would start work on tightening gun laws. Helicopters flew back and forth over the city on a grey, overcast Monday morning. "You will see a highly visible police presence on the streets, around your businesses, around your schools, and even in the air, right across the country," Bush said on Sunday. "So you will feel safe to go about what you want to do." Friday's attack in Christchurch, which Prime Minister Jacinda Ardern labeled terrorism, was the worst ever mass shooting in New Zealand. "What we have a responsibility to pursue in the aftermath of this terrorist attack will include work around gun laws...there are other areas we will discuss as well," she told One News. Parts of the city, including schools, were put into lockdown on Friday after the shootings as authorities assessed whether there were further threats. Ardern said trauma support would be available at centers across the community and in schools. The airport had been closed on late on Sunday, with some flights diverted to other airports, after the object was found. "The NZDF (New Zealand Defence Force) Explosive Ordinance team neutralized the hoax object, and the scene where it was found has been secured," the police said in a statement. "Enquiries are ongoing to establish who left the object."